Andrea started Fantasia 38 years ago as a division of SPS Companies. Fantasia was the first in the Twin Cities to show European tile and plumbing products in the same showroom. In her younger days, Andrea danced professionally in the Twin Cities. She always jokes that her dance background was a natural progression to the tile and plumbing industry! A proud mother, Grandmother and incurable dog lover, Andrea’s other passions are cooking and reading. Nicole has been with Fantasia Showrooms since 2006. She has a passion for materials and the little details that make interiors amazing. Her education and background in design allow her to clearly understand the visions of designers, architects and homeowners alike. Nicole has a serious love of baking, and makes some of the tastiest creations in town. She really enjoys gardening, having become a formidable green thumb. In addition, Nicole delights in traveling with her husband to tour locales both new and familiar. Carri actually started her K&B career at Fantasia after attending her kitchen and bath design program years ago. She has worked in numerous areas of kitchen and bath, which lends her a well-rounded understanding of the business and the needs of her varied clients. Knowing all the little details that will play a part in a client’s selection help her offer superior & creative service. In her personal time she loves working in her yard and on her house, spending time with her family at her family's cabin and hanging with her dog Ella. Ann brought her talents to Fantasia Showrooms in 2006. She wears many hats, handling all the accounting and reporting, as well as most HR responsibilities. Ann is an accomplished professional harpist. Her grandmother always said, “Ann plays harp like an angel and swims like a fish”. She has played for the MN Orchestra for the past several years. In addition to her music, Ann loves to travel. She hopes to visit Australia and New Zealand within the next ten years. We consider them an integral part of the team! 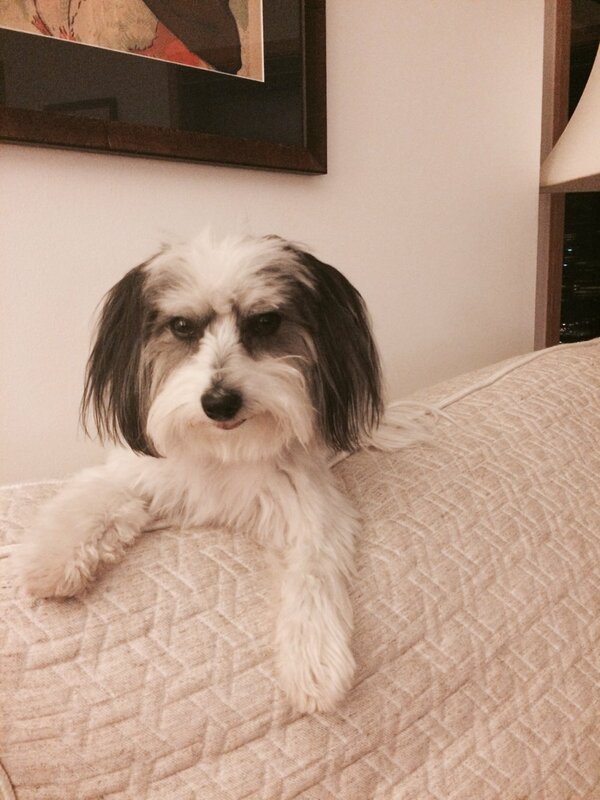 Pearl is a six year old Coton de Tulear. Besides being the cutest and smartest dog in the world, she loves to take walks and hike with her mom and dad. Stella and Lucy have the very important job of protecting the yard from pesky squirrels and they take their job very seriously ( as you can see by this photo). Their tails wag the most when they are sunbathing in the grass or when going for a boat ride at the lake. Ella, aka Babe and Big Girl. Favorite Toy: Anything she is allowed to have. She has quite the collection of tooth paste boxes and envelopes that she just saves, doesn’t chew. Favorite Sport: Jumping off docks and swimming around Carri so she doesn’t drown. Favorite Animals: Squirrels and Rabbits.